I took a peek at Paul's and Jose WinFBE project and notice a OCX calender example.
' Copyright (c) 2016 Jos&#65533; Roca. Freeware. Use at your own risk. DIM wszLibName AS WSTRING * 260 = ExePath & "\MSCOMCT2.OCX"
DIM RTLKEY_MSCOMCT2 AS WSTRING * 260 = "651A8940-87C5-11d1-8BE3-0000F8754DA1"
Seems like a lot of work. 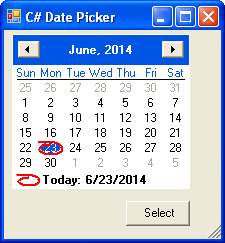 Here is a Script BASIC equivalent with a twist of using the .NET calendar control in C# and made COM visible. print "Failed to create the C# com object did you register the dll with regasm and have .NET installed?"